Vuvox is a website that let's you take your pictures and put it into a type of collage that I've never seen before. There are many other ways to use this site besides collages though. You can make collages, or express, which is just a more interesting way to make an album. 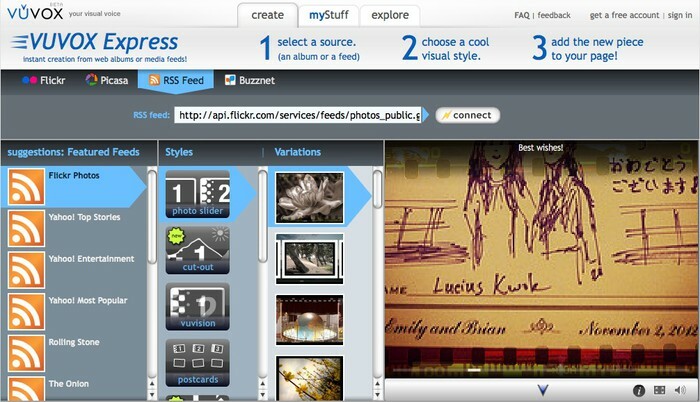 This site lets you share pictures with your friends and family in a creative way! To go to this awesome site, click here! This is another way to make an album that you can share with family and friends. This is what the Collage page looks like, and this is the beginning of a collage. You would scroll over to see other cool features. This is the Vuvox homepage, which you will see when you first reach the site.